According to research, most people fully realize proper disposal of medicines is important. However, one in five report they don’t know safe disposal guidelines. 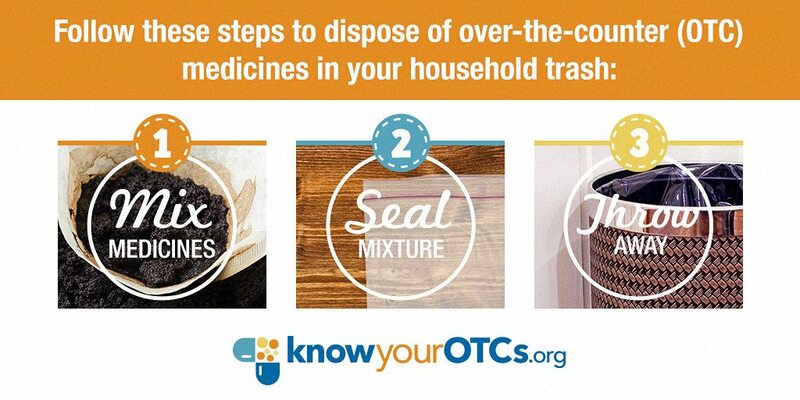 Fortunately, there are several convenient options to dispose of all OTCs, including in your home. Here’s how to do it safely! Option 2: Local Disposal Programs: Check to see if your local pharmacy has a safe medicine disposal program; many have in-store disposal kiosks or provide them to local law enforcement agencies that allow the disposal of unwanted, unused or expired medication – both OTC and prescription drugs – anytime during business hours. For example, Walgreens has more than 600 kiosks at locations nationwide as part of their Safe Medication Disposal Program. Rite Aid, through their KidCents Safe Medication Disposal Program, provides medicine disposal units to law enforcement agencies across the country. CVS’s Medication Disposal for Safer Communities program also provides disposal units to police departments, and disposal kiosks are being installed in 750 of their stores. Pre-paid envelopes are available at all CVS Pharmacy locations allowing customers to mail away their unwanted medications for secure and environmentally safe disposal. Check DEA’s website to locate additional DEA-authorized collectors in your area. Option 3: Community take-back days: Take advantage of events that allow you to take expired or no longer wanted medicines to a specified location for safe disposal. For example, the U.S. Drug Enforcement Administration (DEA) periodically hosts National Prescription Drug Take-Back events where collection sites are set up in communities nationwide for safe disposal. Visit the DEA’s website for more information about National Drug Take-Back Day events. Law enforcement agencies may also sponsor medicine take-back programs in your community. Questions about prescription medicines? For specific information on disposal of prescription drugs, including which ones should be flushed, go to the FDA’s website. New findings about consumer attitudes on OTC medicine disposal are based on a survey conducted by Harris Poll on behalf of the CHPA Educational Foundation. This page was developed in collaboration with the National Council on Patient Information and Education (NCPIE). Founded in 1982, NCPIE is a non-profit multi-stakeholder coalition working to stimulate and improve communication of information on the appropriate use of medicines to consumers and healthcare professionals.